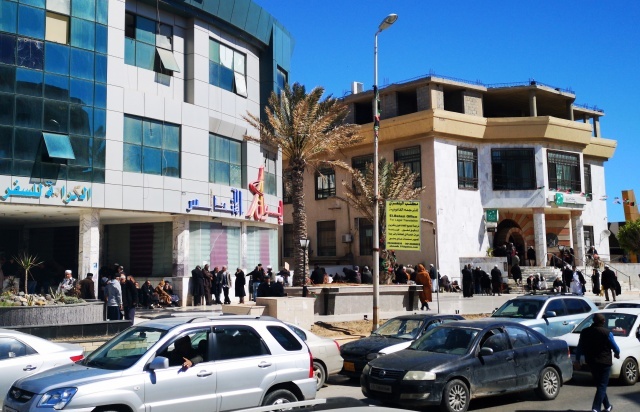 Libyans queue outside a bank in central Tripoli's Al-Andalus district on April 8, 2019. (AFP) - Russia on Sunday blocked a UN Security Council statement that would have called on forces loyal to Libyan commander Khalifa Haftar to halt their advance on Tripoli, diplomats said. After a closed-door meeting on Friday, the council called on Haftar's self-proclaimed Libyan National Army to "halt its military activity" in an agreed statement to the press. Britain then proposed a more formal text for approval to the 15-member council that was opposed by Russia. All council statements are agreed by consensus. The proposed statement would have called on Haftar's forces to halt all military activity and for all forces to de-escalate, according to the text seen by AFP. The draft also would have "called for those who undermine Libya's peace and security to be held to account" and renewed support for a national conference to be held this month on holding elections. Fighting raged south of Tripoli on Sunday, three days after Haftar launched the offensive to seize the capital, now controlled by a UN-backed unity government and an array of militias. The LNA said it had carried out its first air raid on a Tripoli suburb. The UN mission in Libya called for a two-hour humanitarian pause in the fighting that appeared to have been ignored. The health ministry in Tripoli said at least 21 people have been killed and 27 wounded in the fighting. The offensive raised fears of return to all-out war in Libya and left a question mark over the UN-led effort to lay the groundwork for elections with the April 14-16 conference. Libya descended into chaos during the 2011 overthrow of Moamer Kadhafi that has seen a bitter rivalry emerge between the Tripoli-based authorities and Haftar's supporters in the east of the country.